Like many other products we review, I purchased the Hotechs 01LX to do this review. There are a lot of similar MP3 players on Amazon. Some of their reviews are misleading. So, I wanted to see what you really get with it. The Hotechs MP3 player comes wiht instructions, earbuds, and a USB charger in the box. The first time I connected this to my computer it froze and closed down. The second time it worked just fine. So, I’m not sure if that was a fluke or a problem with compatibility and Windows 10. I transferred 75 songs to this device and it took around 2 minutes for 545MB. 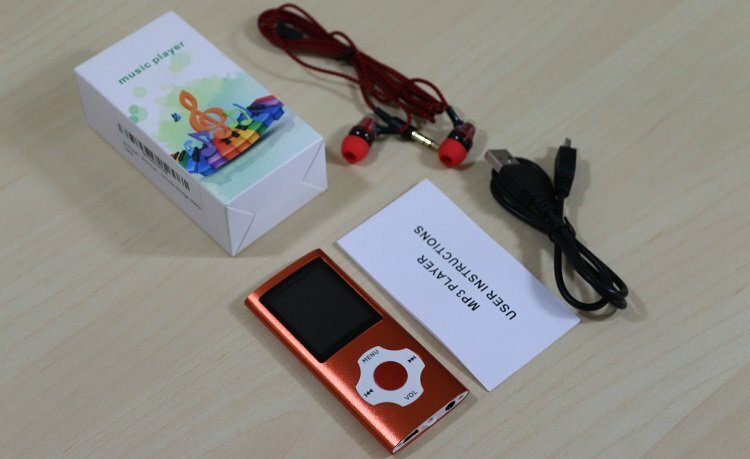 The Hotechs MP3 Player comes in around 10 colors, is lightweight, and portable. This is great for kids. There’s an off switch on top. For charging, it uses a thicker USB to Mini-B cable rather than the Micro B cable. As I don’t have many devices with this cable around the house, it was a bit annoying to use their short cable. Most of the models I reviewed for the $20 to $35 price point had a completely worthless set of earbuds. This model has a pair I’d pay $10 for. So, it definitely has that going for it. The cable is braided which I didn’t care about, but most importantly it had ear pads that were comfortable and form fitting. In addition, the sound was as good as a pair of earbuds I bought for $12; however, with a bit more emphasis on bass. 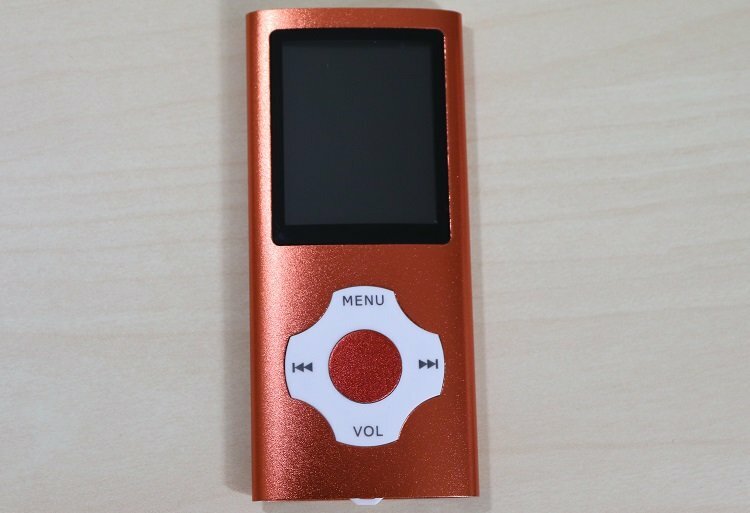 I like this little MP3 player for what it is. It’s simple, inexpensive and sounds pretty good too. However, the menu is terrible. I couldn’t figure how to get back to the “main menu” from Music and Sound options at first. Instead, I had to shut it down to be able to scroll back through the main menu applications. After a while, I figured out that if you held the menu button it would take you back. There’s also not an intuitive way to reach the dropdown list of songs. At first, this meant I was skipping through my music to find what I wanted. I figured out if I pressed the menu button a few times I’d see a drop-down list. Then, I could use the skip button to move down that list and ultimately had to press menu again to select the song I wanted. Phew. That was far too difficult. Once I figured it out it was fine. But, don’t expect young children to be able to figure this out without showing them how. It would be good if the navigation instructions were in the instruction manual; however, the instruction manual is limited at best. The radio on this $20 device was better than many of the MP3 players I reviewed in the $30 range. I could hear my local stations without static. You can even record radio programs. Interesting. The 1.82” display on this device was much clearer than other options in this price range. It supports AMV and AVI format video. If that’s something you’ll use, great. For me, it was pretty worthless. This MP3 player sounded good with the provided earbuds as well as another pair that I used. It’s definitely good enough for my kids, which was its purpose. Once I figured out the menu, I didn’t hate this device. In fact, at that point, it became a great buy. However, if you don’t figure out how to use it, you’ll probably hate it. Navigation is a bit slow and again, not intuitive. Everything else about this device is how it should be. For $20, you get good sound, solid radio tuning, and even good earbuds. It’s slim, lightweight has great color, and something your kids will like (again) assuming they know how to work the menu. If you’d rather have a visual on the menu, check out my video for more information.